Farm to table is a big thing nowadays, but since I don’t have a farm I’m calling this my backyard to table salad. Yup the peaches came from my tree and the fresh herbs from our pallet garden. Let’s chit-chat about the pallet garden. This was my wife’s project and I must say it’s kinda cool to have so many fresh herbs available. Usually I’ll plant a few of my favorites but this time, she loaded up the pallet with all sorts of different herbs like purple basil, oregano, thyme, chocolate mint (yes it totally does taste like chocolate) and lemon balm. My peach tree has been faithful every year producing a lot of juicy peaches, so be prepared for stacks of peach recipes heading your way! Not all of those recipes will be sweet. 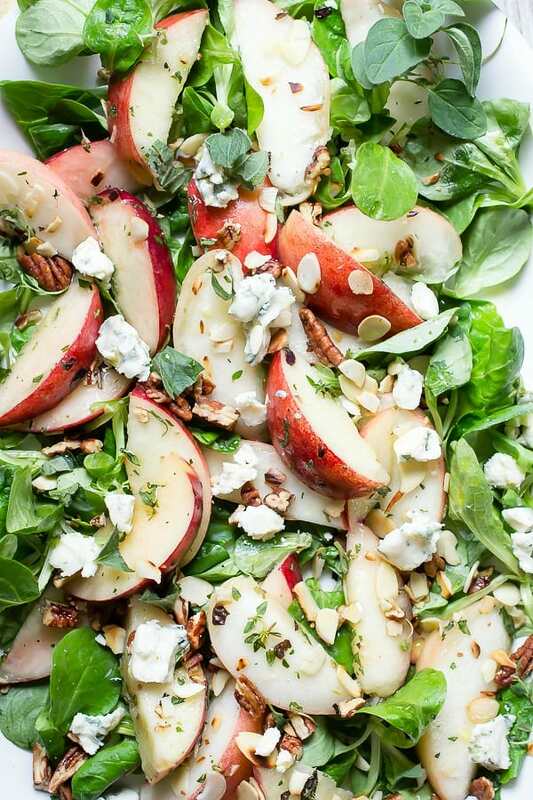 Just like with this herb salad, peaches taste great in savory dishes too. A simple olive oil dressing with some lemon balsamic and the herbs make it perfect for summer. Don’t be skimping on the cheese, I used a good sized chunk of Point Reyes Blue Cheese, it’s creamy but perfect for crumbling over the candied pecans and toasted almonds. Sweet meet savory…savory say hi to sweet! And they all lived happily ever after! Here’s some more fresh peach salad links! 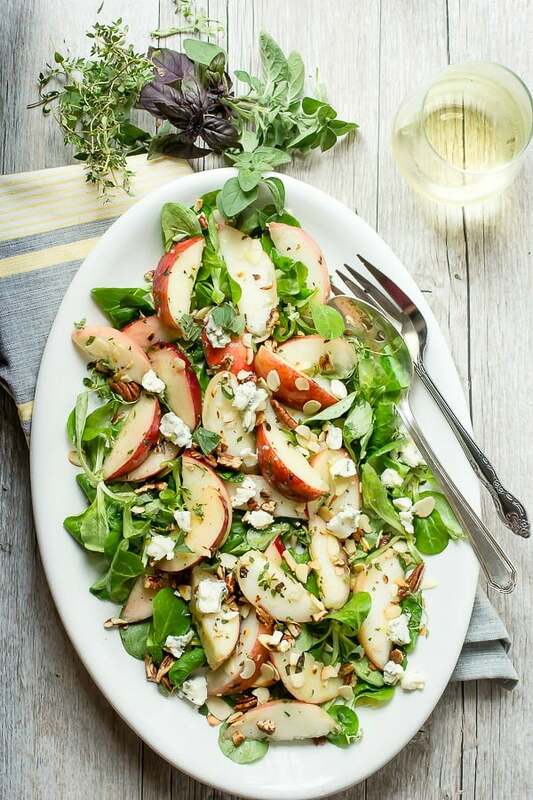 Fresh ripe peaches are tossed with garden herbs and olive oil, laid on a bed of greens and topped with almonds, pecans and blue cheese. Slice the peaches into thick wedges and transfer to a large bowl. Add the olive oil, vinegar, thyme, oregano and basil. Toss gently to coat the peaches. Lay the mache leaves onto a large serving platter. Carefully place the peaches on top of the leaves and sprinkle both types of nuts over the salad. Top with the blue cheese crumbles. Drizzle some olive oil over the whole salad and serve at once. Garnish with extra torn herbs if desired. If you can't source lemon flavored balsamic, you can replace it with fresh lemon juice. 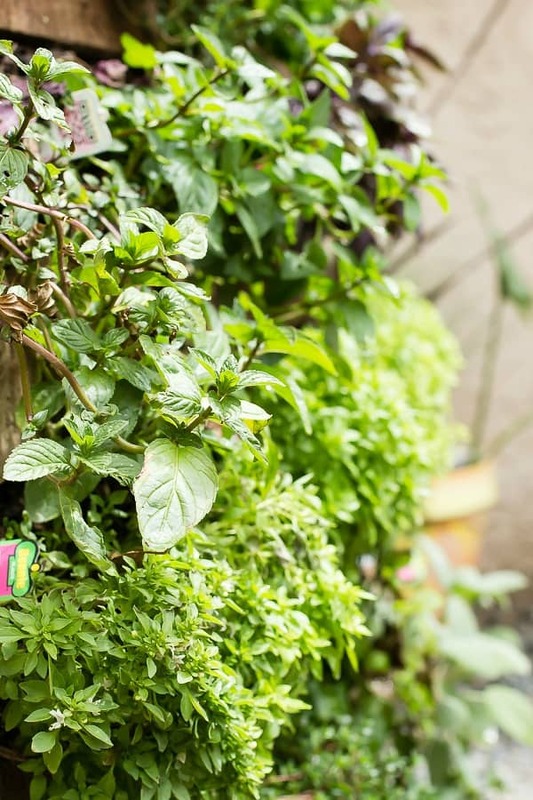 You can use any small leaf type of greens such as watercress leaves or baby spinach. Such a nice and light salad for summer! 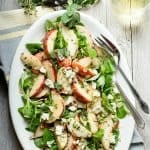 Peaches and blue cheese make killer pizza toppings so I know this is one great salad! Beautiful summer salad! also, I had no idea chocolate mint existed- must try it soon! I made this to take to a family dinner tonight. It was so easy and good! Perfect for peach season. Thank you! The only change was that I didn’t candy the pecans to humor the health nuts. Just toasted all the nuts together. Hey Jen, awesome I love that and thanks for the feedback! !